ARE WE OUR OWN WORST ENEMIES? 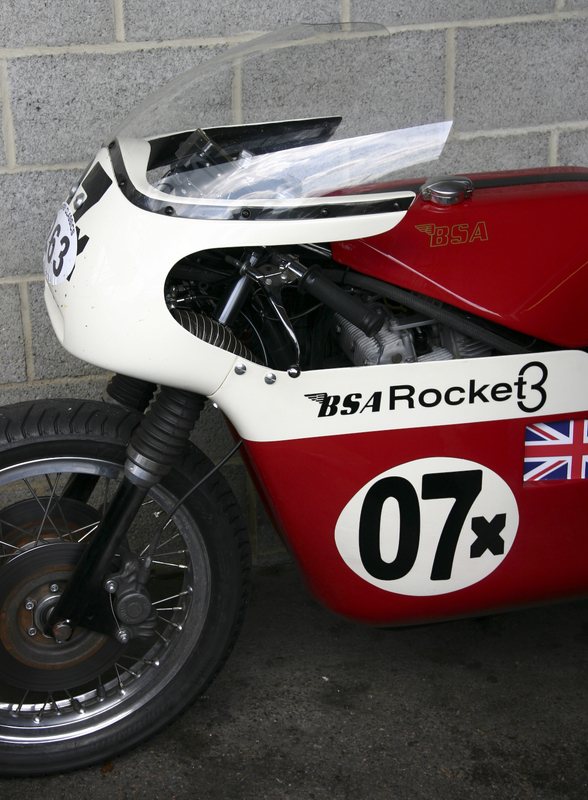 In 1976, the closest that I got to a Moto Guzzi Le Mans was the framed poster on my bedroom wall. Actually, it wasn’t a poster but a page, carefully torn from Bike Magazine’s road test of the period. The picture was of a brand new Le Mans resting on its side stand in front of a dark wood. The woman sitting on the bike emphasised its beauty and diminutive size, and her hand casually caresses the right hand rocker cover. It’s an iconic image and can still be found. 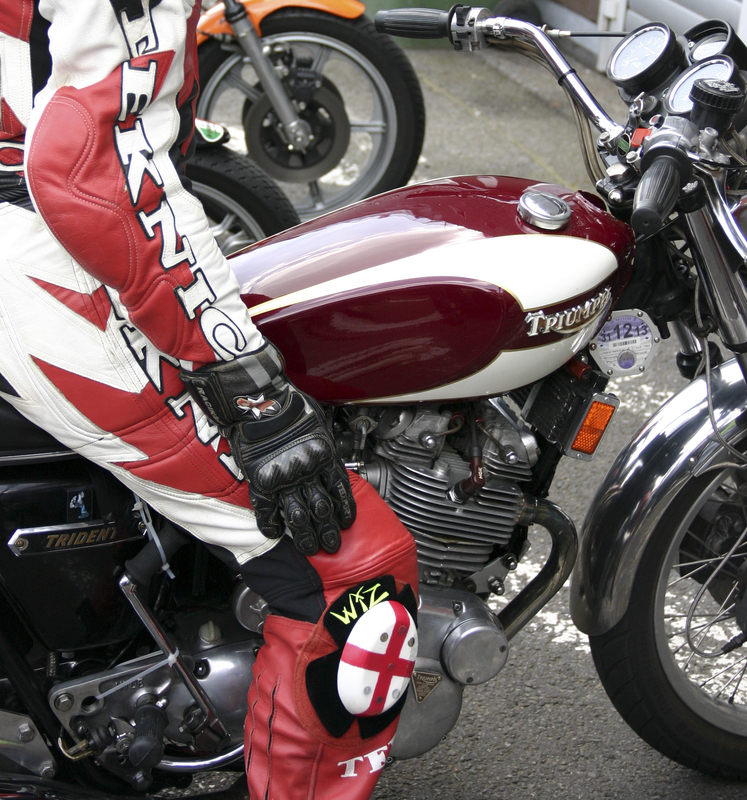 It’s difficult to sit astride a Le Mans without resting one’s hand on a rocker cover from time to time, the 90 degree V twin is perfectly placed to remind the rider of the link through touch between man and machine. Thirty-seven years later and I am riding my very own Le Mans across south London to join a couple of others. We are meeting outside what used to be Streamline Motorcycles on Lordship Lane in Dulwich before heading to the circuit at Spa-Francorchamps in Belgium to watch bikes from the 70s race in the Biker’s Classic event. By coincidence I bought a Honda 250 from Streamline when I took my test back in June 1975; I thought that my bike at the time, a CD175 with Dunstall megaphones, was too loud for the purpose so I traded it in for an ultra quiet and boring 250 Honda G5. Today the three Guzzis are loud, proud and not at all boring. It’s 07.30am on Friday 5th July 2013 and I arrive a few minutes after the others. We exchange a couple of words before setting off for the chunnel. 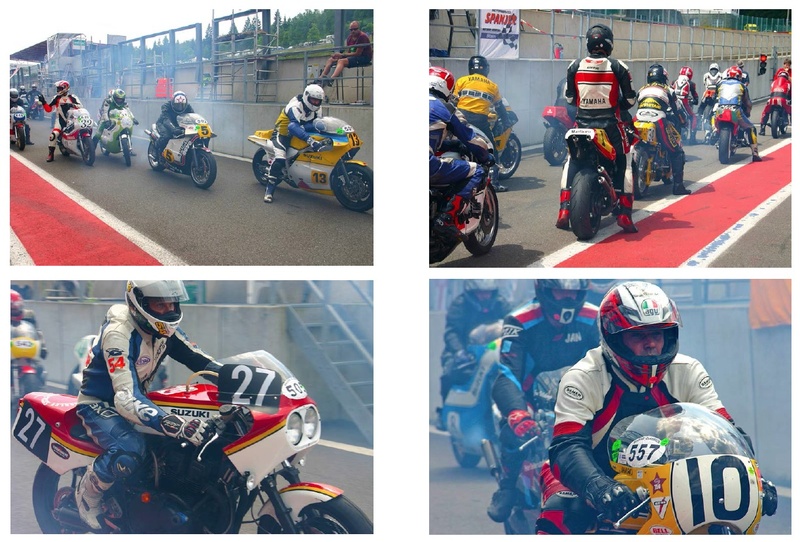 Pete’s endurance replica Guzzi is already smoking like Dave Allen, which isn’t a good start to the weekend. I am the first to notice as Justin led Pete on the way to the rendezvous. I don’t relish the taste of burning 15/40 smoke for breakfast and we pull over after less than a mile. I suggest a blast down the A2 to check oil usage; possibly not too clever a suggestion but I am anxious to get on the road. 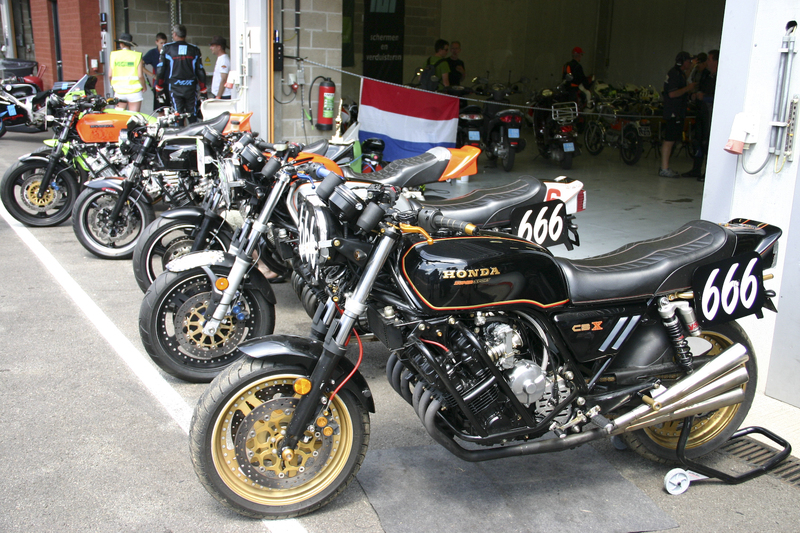 I have kept a few smoking bikes running in my time, by keeping them topped up with oil, but I’ve also blown a few up. Pete is clearly uncomfortable with this and Justin suggests going back to Putney and grabbing Pete’s other Le Mans. Of course, Pete has two of the beauties, I had momentarily forgotten in the excitement of the off. With 35-year-old classics it’s always handy to have a back up and we have shedloads between us. So we head back around the South Circular Road to Putney. The rush hour is kicking off and somewhat tough going for three men with combined age of 155, on a trio of café racers that were designed for the open road. Back at his lock up, Pete gets the blue one out fires her up and we are off by a more direct route via Sutton and the M25. We are well on our way and I relish the opportunity to open the old girl up on the motorway. Pete does the same and before we know it we have lost our friend altogether. I’m used to riding alone and soon realise that riding together requires some planning. Pete and I peel off at the first services, park on the bridge and start looking forlornly for a red Guzzi, of which there is no sign. We phone a few times and eventually speak to Justin who is a bit miffed. It turns out that he’s in the services a few hundred yards away. 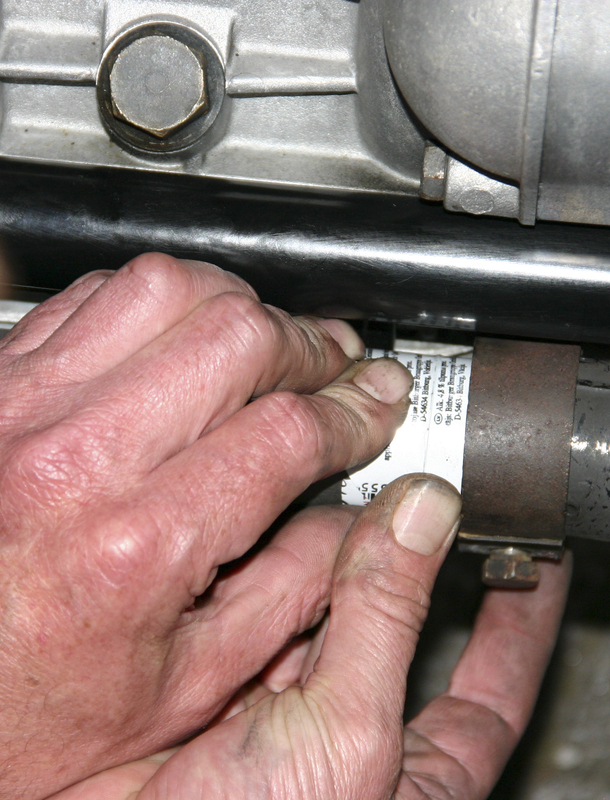 He has his 13mm spanner out and he’s tightening the right hand exhaust flange as he thinks the gasket has blown. The train is only 20 miles away so we press on with Justin’s exhaust blowing. At the Chunnel terminal we ring our fourth Le Mans man, Sam, who is coming to meet us from Marburg in Germany. He hasn’t left home yet so he pockets a pack of gaskets from his extensive stock of spares. We are waved on to the train just as I grab a coffee along with a sausage and runny egg roll. I somehow manage to get most of my breakfast aboard but holding a hot coffee while operating a clutch is not recommended. Twenty-five minutes later we are in France, the train being a bit more reliable than our bikes. It feels great; we fill up and head east. Well west first, as Justin takes a wrong turn and leads us back towards Calais popping and banging. Pete and I follow like sheep keen not to lose him again. It would be fair to say that in the heady excitement of preparing for this trip, we may have skipped a few details, like planning a proper route. The idea was to find nice fast A roads but with Justin’s bike not too well we opt for a motorway to get to Spa as simply as possible in order to fix the bike. It is soon late afternoon so we stop for steak and chips at a motorway services; food that Michel Roux would be happy with, and a far cry from a tepid hamburger in Leicester Forest East. Leaving France we know we are in Belgium when the roads change from perfectly smooth to totally lethal. I see Justin’s bike leap into the air and squirm upon landing after hitting a pothole. It’s not fun and soon we are filtering through an endless traffic jam, just like the south circular but worse. We crack on, things get better going around Liege. The road clears, the surface improves and soon we are sweeping through beautiful forest towards Malmedy. We have arrived. The circuit is close by, the weather could not be better and Sam has cold beers in the fridge of our weekend apartment. It has been a pretty yin yang journey so far. About 20 years earlier three of the current quartet did a similar trip to Le Mans for the 24-hour bike race. That time the flywheel came off Justin’s Guzzi, after one bolt worked loose the rest quickly sheared! We repaired it en route at a friend’s place in Normandy. We were a bit younger then and got the motor out in 20 minutes. It took a few hours longer to put the bike back together (with new bolts supplied by the local tractor shop), but we did and it worked. Three of the same people now find ourselves fixing the same bike. 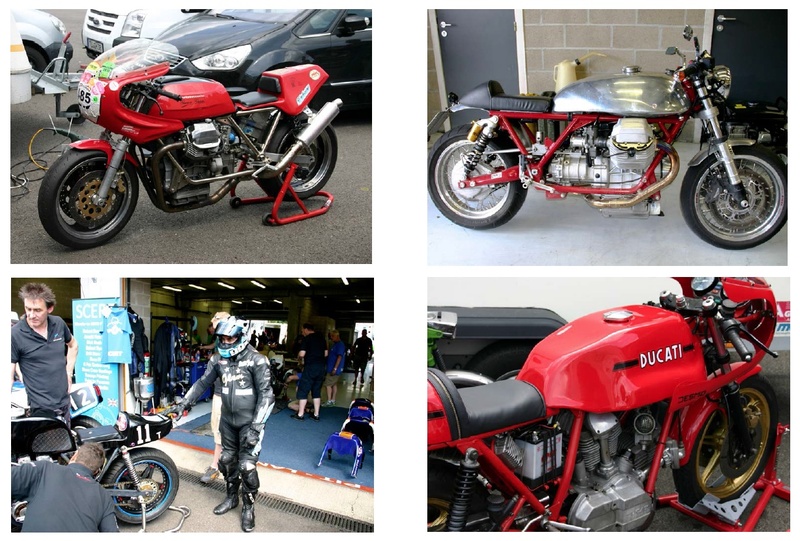 Now, like back then, not much is said, we all know how to pull a Guzzi apart and just get on with it to get our mate back on the road again. We remove the exhaust system and find that the problem is not simply the gasket, the flange on the head end of the downpipes had cracked and broken off completely. Packing three gaskets in does little to improve the problem. 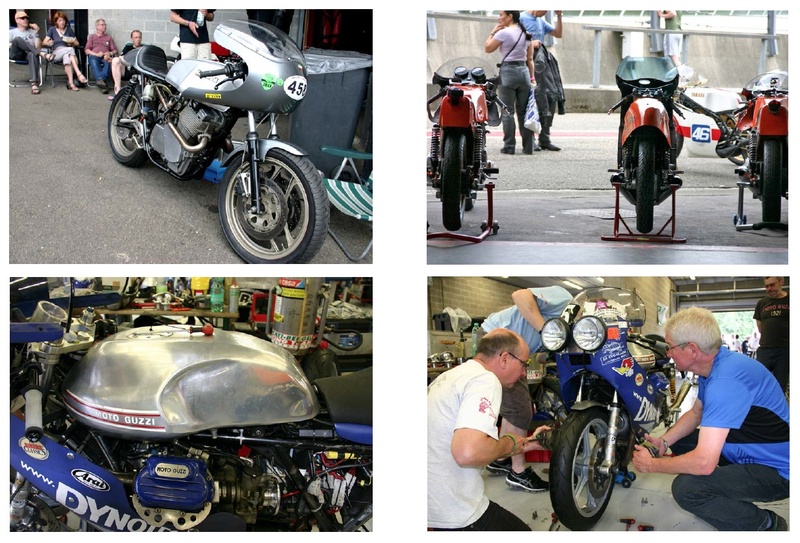 Some frantic brainstorming helped or hindered by a few cold beers: find a welder at the track? 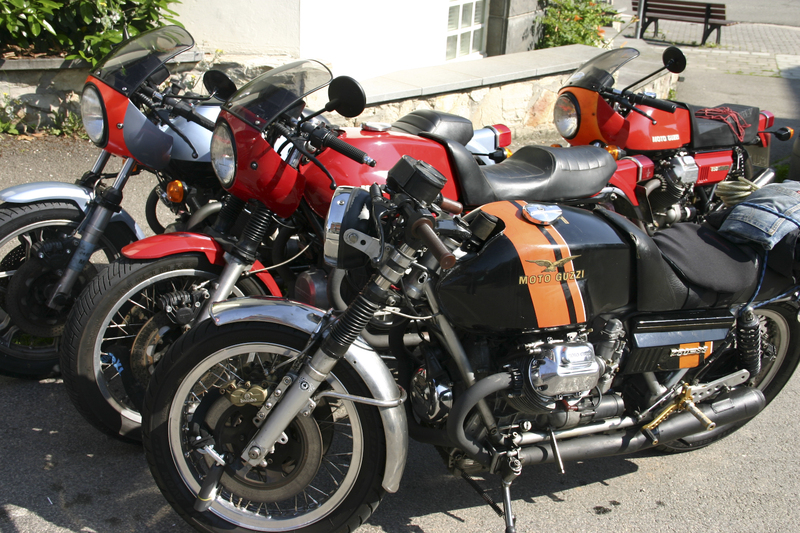 Find a Guzzi dealer on Saturday? Call Carole Nash? (Definitely the least preferred option, none of us want to go back on a breakdown truck. Pete did that on our last Le Mans trip four years earlier, but that’s another story.) Then Justin remembers that he has his 36 mm downpipes in his garage in London (the broken ones are 40mm). Pete’s pal Zade is coming out on Saturday, so we now have a plan. A few phone calls later and Zade agrees to detour via Justin’s place and bring the spare pipes out the next day. Justin has never met Zade, they are simply both motorcyclists. On Saturday it is even hotter, clear blue sky and evergreen forest surround us on the way to the track. 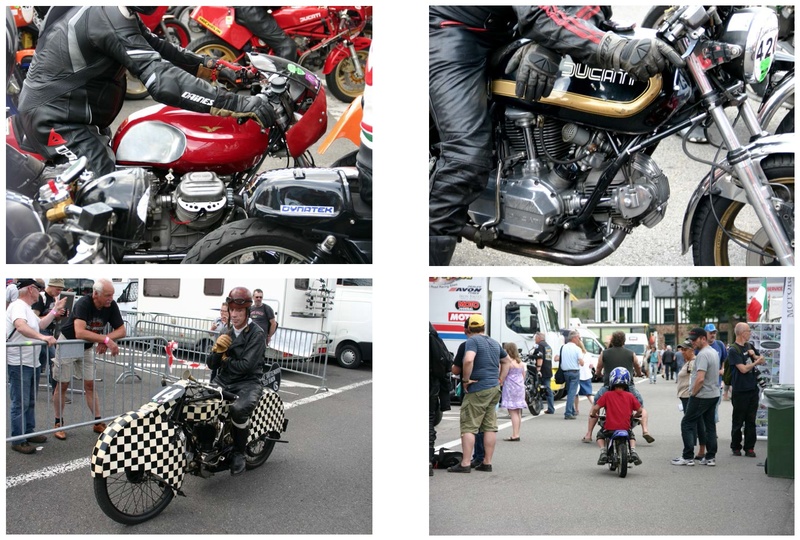 It is fantastic, you are allowed to wander freely through the paddock and pits at this event. We spend time admiring perfect Guzzis and discussing technical points with team mechanics who are only too willing to share their passion and time in the relaxed atmosphere. We find Bob Collins of Team Glam UK. Bob runs FWR tyres in Kennington and usually loves a chat but he is not a happy chap today. His P&M Kawasaki is playing up and he has pushed it back in after practise, “It was hard work” he says with typical understatement. 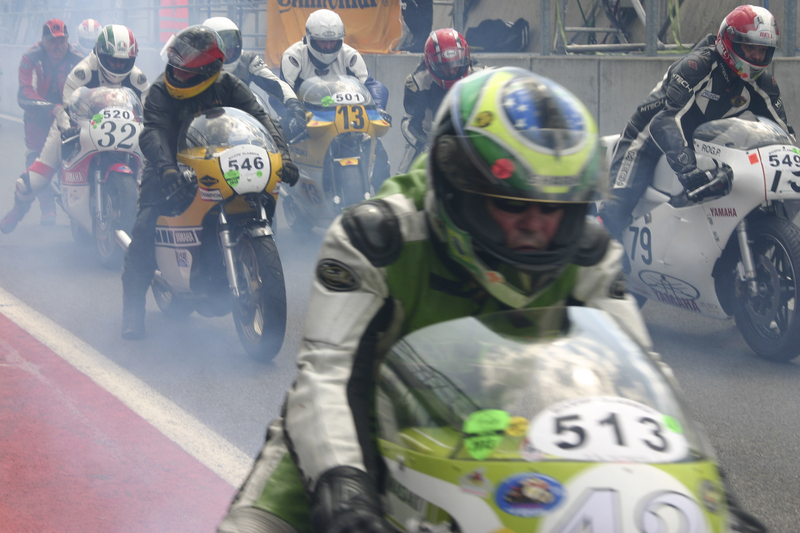 I later learn that in the race he worked his way from the back of the grid into fifth place before his bike expired. I bet it was fun though carving his way through seventy bikes. He will be back next year. I take lots of pictures and see many styles of rocker cover. I like the blue ones and Justin gets inspiration for his next project Guzzi. 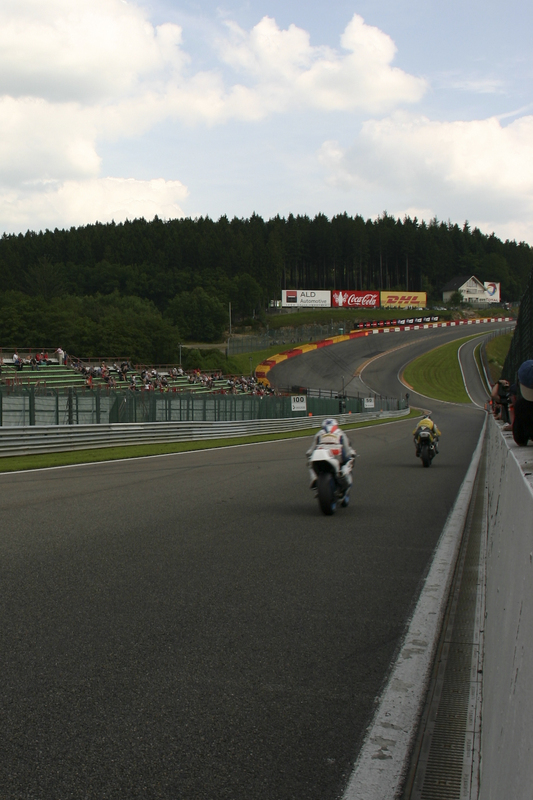 We find ourselves adjacent to the track in the pit lane where there are gaps in the fence, enough to squeeze our heads through and be within a meter or so of the bikes blasting by at what we estimate to be around 135 mph. We feel the wave of power as they pass, which is hard to describe. We are mesmerised. 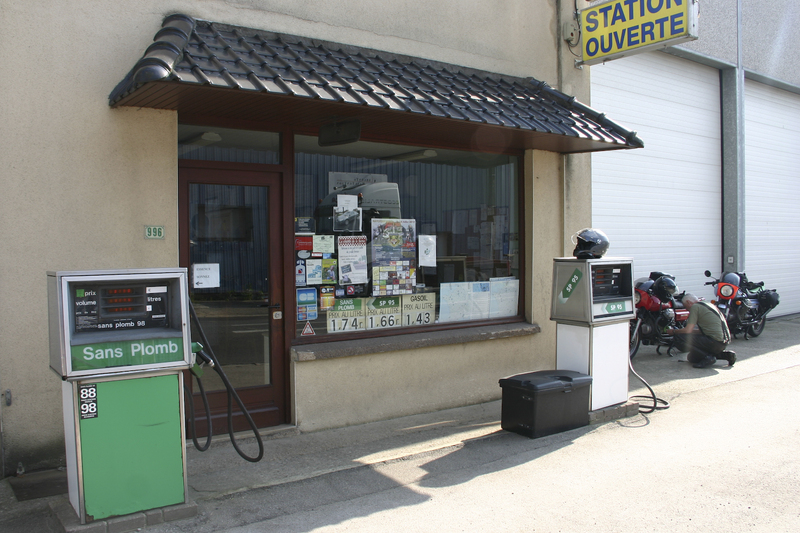 We wander round overdosing on the atmosphere, buy some frites, and head back to the bikes where we find a German bloke wearing a Guzzi T shirt admiring our machines. 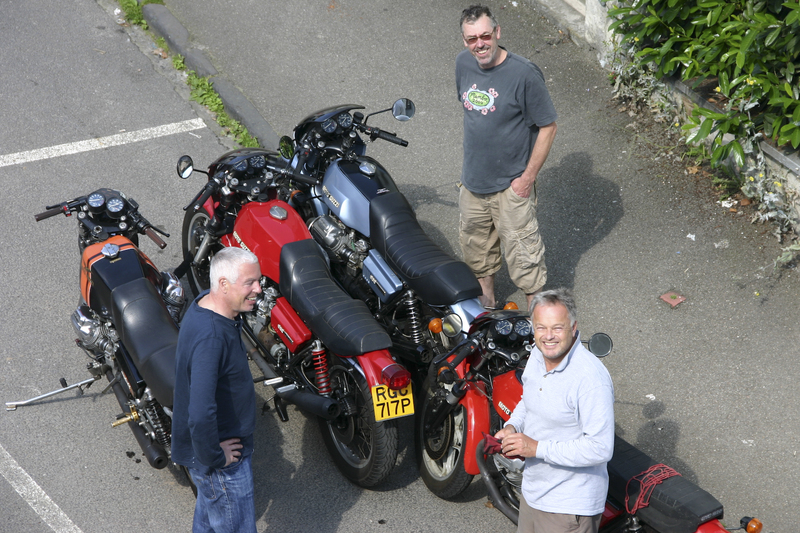 “Have you got a Guzzi?” we ask. “I have 45,” he replies “come and visit my small museum sometime”. We will. Back in Malmedy, most of us succumb to pizza and wine. Justin and Sam abstain and wait for Zade with the downpipes. Justin wants to fix his bike and ride to the track to see some of the racing at night. Zade arrives at 9pm on his Speed Triple having enjoyed the back roads. As darkness falls we fit the pipes. A chap on a Goldwing pulls up and provides extra light. There is no common language but he’s a biker and he knows what we need. The pipes are fitted and we pack the 4mm between pipe and Lanfranconi ‘silencer’ with aluminium sheet from beer cans. 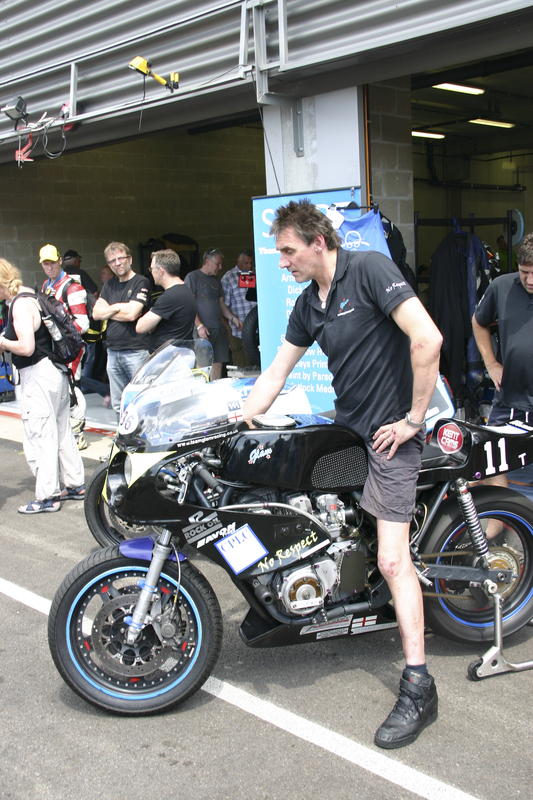 Justin’s bike is soon sorted and he and Sam head back to the track to see race’s climax at midnight. In the morning we are up and ready to go by ten. Zade hasn’t been to the track but he decides that he wants to ride back with us. We consult the map and choose proper fun roads. It’s that old thing, having watched bikes ridden so well we are eager to have a go ourselves and before we know it we are seeking a restaurant for lunch. Another short fast ride later we are back on the Chunnel train again. Back in England, Pete’s bike starts misfiring; it gets him home before stopping for good as the front wheel crosses the threshold to his lock up. It turns out to be a dodgy ignition wire, but it had made the 700-mile round trip. Next year Zade might actually see some racing, and my bike may be the one to break down. But whatever happens we will be back. Just try and stop us, everything comes to he who waits. 17 Comments so far. Feel free to join this conversation. Awesome adventure, splendidly written; how I envy you guys! Thanks Helmut, join us next time! Glad you enjoyed it. Have you got a Guzzi yourself? Same again next year….by boat? Really, relly enjoyed that account! Thanks. Fantastic. 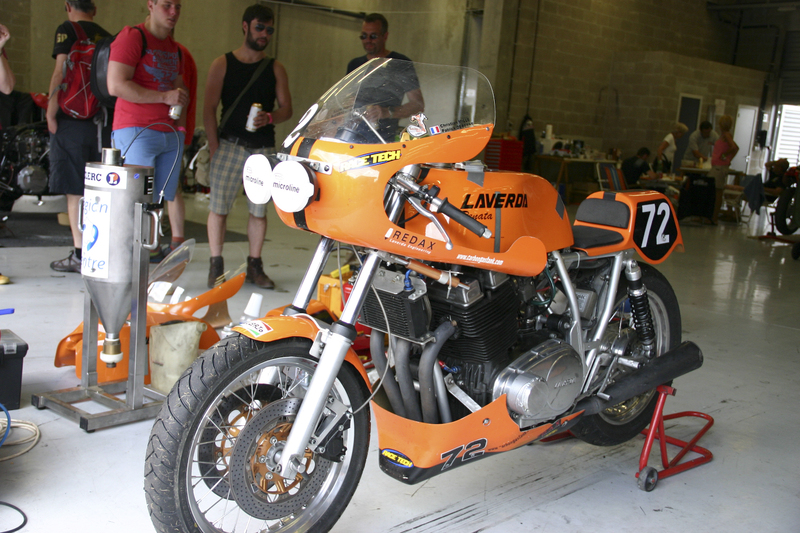 Has this article been published in Gambalunga, the Guzzi Club Mag? If not, it should be! Loved reading that, I agree with Tim, it should be in Gambalunga. Love my guzzi California III. Awesome bikes, no other make remotely like them. Steve & Tim, I know Neil has spoken to the editor of Gambalunga and suggested that he speak to us because he knows that we would be happy to share the article with your club magazine (well it would be very un-Digest if we didn’t). 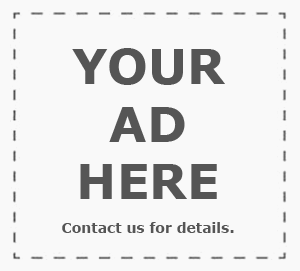 In the meantime I’m glad you enjoyed the article, be sure to pass the link along to your fellow Guzzisti (and Guzzista?). 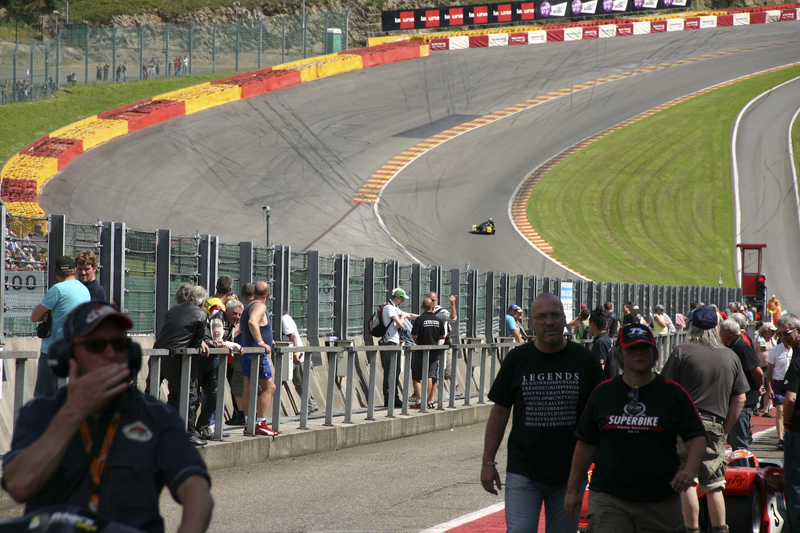 We certainly will, pics are great as well and…..my favourite circuit in the known world, it just gets better!! Is that Steve Sharpe from Surrey TRF? I’ve shared it…very much enjoyed by all. I must undertake such a trip on my LeMans 2 one day! Will it be OK? It has 123,000 miless on it. 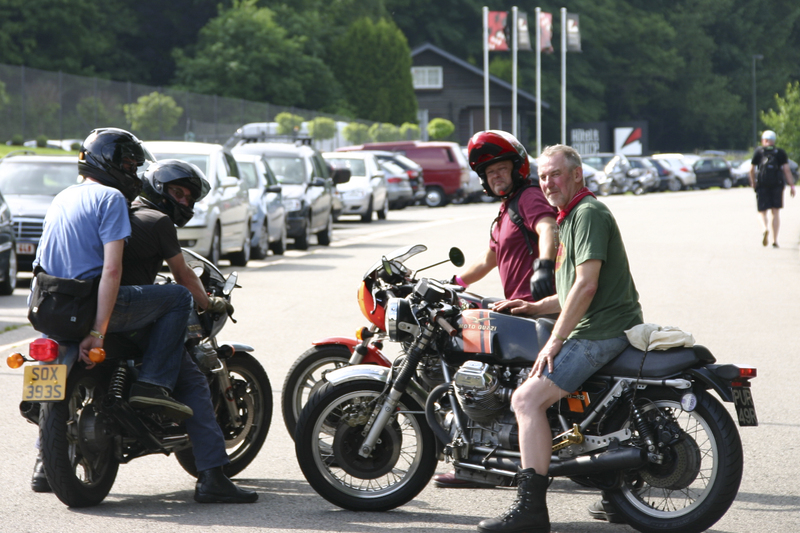 Half the fun of a GUZZI is the adventures you have when things go wrong .The one who must be obeyed can tell a story of almost every trip on the BIG PIG where we have met wonderful kind helpful people across the continent and England .If anyone of you are reading this a big THANKS!